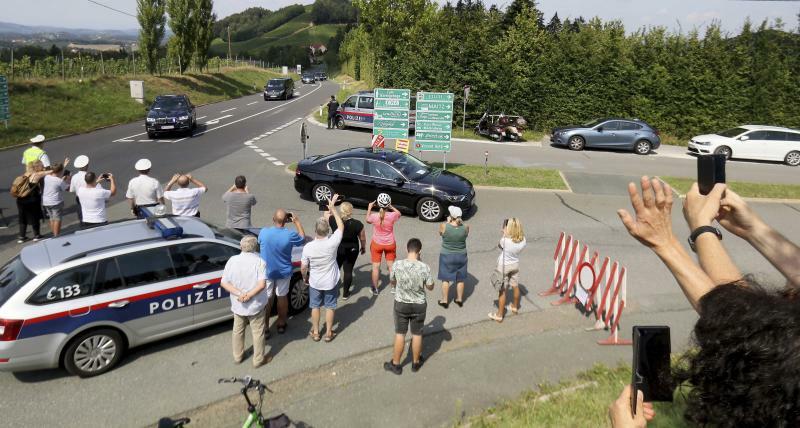 BERLIN (AP) — Russian President Vladimir Putin made a flying visit to Austria to attend the wedding of the country's foreign minister Saturday before heading to Berlin for talks with German Chancellor Angela Merkel. 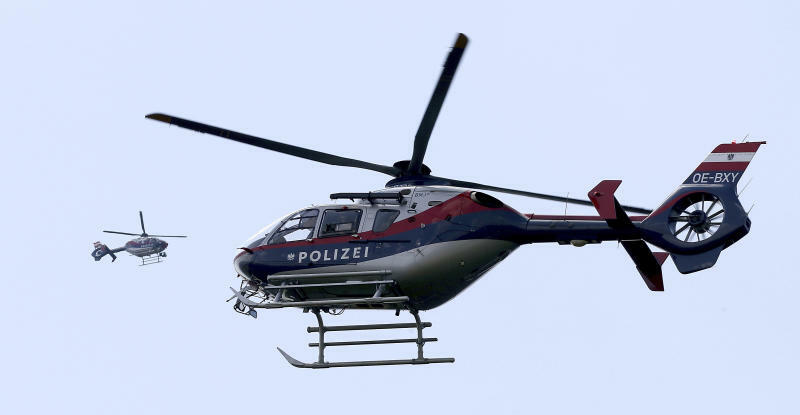 Austrian authorities imposed tight security measures around the site of the ceremony near the southern border with Slovenia, where Foreign Minister Karin Kneissl married her partner Wolfgang Meilinger, a businessman. Kneissl, an independent, was nominated by the pro-Russia Austrian Freedom Party, whose leaders also attended the wedding. 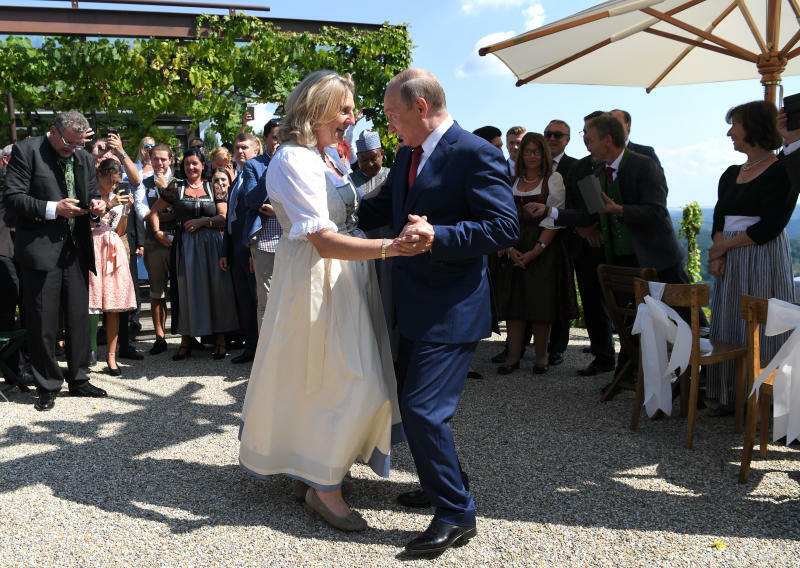 Photos showed Putin dancing with the bride, who was dressed in a traditional Austrian costume. According to Austrian public broadcaster ORF, Putin also brought a small Cossack men's choir along to entertain about 100 guests at the wedding. Austrian lawmaker Joerg Leichtfried of the opposition Social Democratic Party criticized Kneissl's decision to invite Putin to the wedding, saying it called into question Austria's role as a neutral intermediary in the conflict in eastern Ukraine, where Russia-backed rebels are battling government forces. Austria currently holds the European Union's rotating presidency. Putin spokesman Dmitry Peskov told Russian news agencies that the Russian president spent about an hour at the wedding. Putin gave the newlyweds a cold press oil machine, a traditional Russian samovar and a landscape painting that "depicts the place where the groom hails from," according to Peskov. Peskov said Putin said "quite a long toast in German in which he said he was thankful and happy that he got a chance to visit the hospitable Austria." Speaking hours later alongside Merkel before the two leaders held bilateral talks at the German government's guesthouse in Meseberg, north of Berlin, Putin said they would discuss bilateral ties, economic cooperation and Russia's Nord Stream 2 gas pipeline beneath the Baltic Sea. The United States and some European countries have criticized the pipeline, saying it could increase Europe's energy dependence on Russia, harm Ukraine — currently a major gas transit country — and pose an environmental risk. Germany imported 53 billion cubic meters of Russian gas last year. "Nord Steam 2 is purely an economic project and it doesn't close the door to shipping gas through Ukraine," Putin said. Transit fees for Russian gas are an important item contributing to the Ukrainian budget. With protesters audible Saturday outside the guesthouse in Meseberg, Putin also raised the issue of humanitarian aid and funding for international reconstruction in Syria. "It's important to help those areas that the refugees can return to," he said. "I think it's in everyone's interests, including Europe's." Germany, which has taken in hundreds of thousands of Syrian refugees fleeing the war, has in the past insisted it wouldn't contribute to the reconstruction of Syria before a political settlement to end the war has been reached. Merkel said the talks would also touch on the possibility of establishing a United Nations mission to help bring about peace in Ukraine. Nataliya Vasilyeva in Moscow contributed to this report.